As part of my work on the Blue Ribbon Commission on Marijuana Policy I spent an intriguing and enjoyable couple of days in Humboldt County with California Lt. Governor Gavin Newsom, Congressman Jared Huffman and State Assembly Member Jim Wood. We met with growers, toured a cannabis nursery and also held a public forum. This photo of the forum, taken from the back by journalist Grant Scott-Goforth, gives some sense of how well the event was attended. The room was crammed with over 200 people who stayed until the end (despite the room’s considerable heat) to articulate their concerns. The main anxiety small farmers in Humboldt expressed has a rational basis: A legal pot industry could very easily be dominated by big-time corporate producers that squeeze small farmers out of the business. In an unfettered free market (which some legalization activists favor), most of the small farmers in Humboldt would be out of work in no time. But how legalization is implemented can influence whether big corporations become dominant. The planned Ohio marijuana initiative is an example of the kind of corporate giveaway that would destroy the Humboldt farmers overnight: Ten rich investors are campaigning for all legal marijuana to be grown by just ten rich people (you will never guess which ten…). In contrast, the Washington State system issues many growing licenses with a cap on the size of grows, which allows small farmers a fair shot at becoming part of the legal industry. 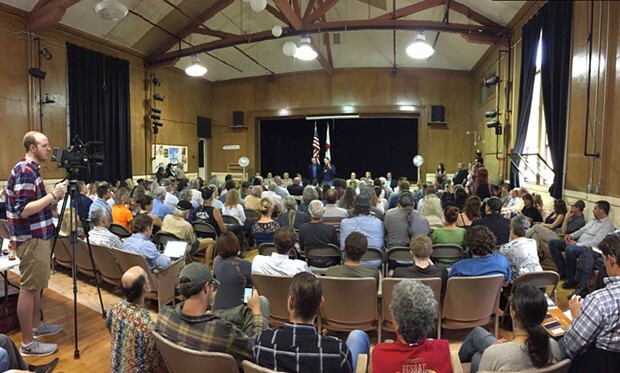 What California does regarding legalization is in the hands of the initiative writers and the voters, but any initiative that doesn’t make room for small cannabis farmers will surely encounter heavy resistance in Humboldt County.